When is the best time for RV road trip in Canada? When to take an RV trip in Canada ? Naturally, the summer is the best time to enjoy your RV rental in Canada. While it is possible to rent an RV in Canada from May 1 to October 31, we recommend travelling between mid-May and mid-October. In any case, many tourist attractions and campsites are closed outside of this time period. Peak season for a Canadian RV Road Trip is from early July to Mid-August. 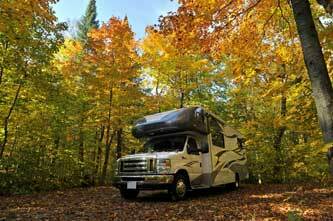 RVs are in high demand at this time, and availability is extremely limited. If you plan to travel in July or August, be sure to reserve your vehicle at least six months ahead of time to be sure of getting the RV of your choice. It is also worth noting that you can save significantly by booking early, as most suppliers offer special deals for reservations made before December 31. You should also be aware that there are many more travellers on the roads in July and August. June and September are pleasant months for RV travel because the weather is good, there are fewer tourists and rental prices are more competitive. Early October is a spectacular time in Eastern Canada. It is Indian summer, when the trees are dressed in their brilliant hues of red and gold and nature is in full splendour! However, the nights can be quite cool. How do I reserve my RV? Can I cancel my RV reservation for free? What kind of driver's license do I need?